Chephren at Night, 1984 Egypt, Giza Province (Governorate) – 35mm film Around the World 1982-1984 – Egypt The Sound and Light Show illuminates the Pyramid of Chephren as seen from the top of the Pyramid of Cheops. Arrived in Cairo. Pain and disappointment upon finding that Gabrielle had left last night on the train to Aswan … My outlook, dimmed by tiredness and the heat, was not bright… a closing in, a sense of despair, loneliness and the (trite) thought: ‘When the going gets tough, the Tough get going.’ And the love for Adventure, the realization that sacrifice goes in hand with accomplishment (= realization of dreams) and most of all the bottom line: not to let it get to me, not to give up. It is what prevents people from doing what they want to do: hard times. Spent late afternoon at the Sphinx, the Great Pyramid, and the surrounding pyramids. At night, I returned before the Sound and Light Show began. I climbed the Great Pyramid of Egypt, Cheops. I sat on top considering that my troubles were not so bad when I could experience such fantastic things. Then the light show began. I was elated. 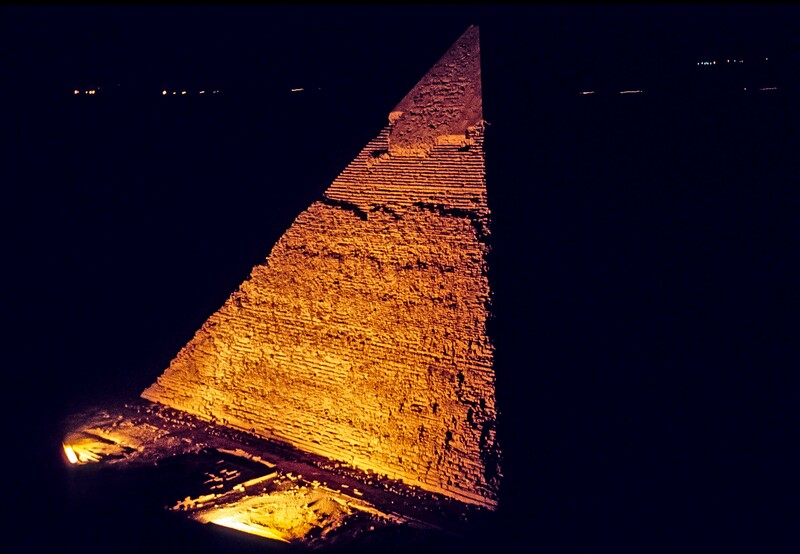 The Pyramid of Chephren and the Sphinx were illuminated in colored lights. I whipped out my camera and finished what was left of the roll. I waved to the audience when the Great Pyramid – I was standing on its top – was lit in yellow. (Ed. note: I doubt they actually saw me).When I returned to the Marwa, I phoned Cindy. She reluctantly let me in. I slept on the floor and later crawled in bed with her. 1pm – I’m sitting on the waterside of the Nile under trees in the breeze below the Meridean Hotel. Jeshua is meditating over on the wall. Trees, hotels, boats plying upriver. The water ripples and sags. Plants set adrift bob up and down. Hums, water, strange birds, the noises, wind on my ears. I think I could live a life in Africa. Retrospective… I went to the pyramids with Jeshua. We went inside the Great Pyramid. I went alone up the corridor to the tomb deep in its heart, a square granite room four meters high. I lay down in the stone sarcophagus when all the tourists had gone. Soaking it up. We walked around the pyramids, the Sphinx. Had falafels and tamarindo in town. We gazed to the top of the Pyramid of Chephren (which still wears much of its smooth cap) figuring out if it was feasible to climb it. I went to the Marwa Palace at 6pm, and found Bill and Dan there. I went to the Select Hotel and got my things then returned to the Marwa. I ended up walking with Bill and Dan for hours. We had a good time. I started scaling up Cheops at about 1:00am. Because of guards near the corner, I had to climb up the center of the pyramid with my guitar on, pack and bag. Precariously balanced, I inched my way up for one and a half hours. There was no one at the top but me. I played the guitar with my bottom naked, rocking on the top of the Great Pyramid.